Section headings and selected papers: General Presentation. Motion control: an emergent technology, A. De Carli. Modelling, Simulation and Design. New geometric parameters for the modelling of simple or closed-chain mechanisms, M. Ait-Ahmed & M. Renaud. Instrumentation (Plenary Session Papers). Advanced techniques in commercial AC drives, T. H. Chin & K. Matsuse. Instruments and Actuators. Bilinear modelling and state-feedback control of an electro-hydraulic drive, X. Yin. Control Strategies. (Plenary Session Papers.) Identification and digital control of electrical drives, I. D. Landau. Control Strategies. Advanced variable structure control of high performance drives, A. Balestrino et al. Drives. Nonlinear torque tracking control of induction motors, C. Canudas De Wit et al. New Control Strategies (Plenary Session Papers). 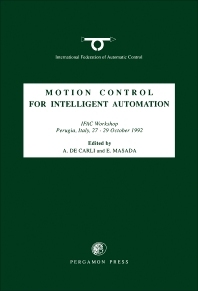 Variable structure controllers in motion control systems, A. Sabanovic. Neuro and Fuzzy Controllers. Steering the state of non linearly perturbed linear systems by learning, P. Lucibello. Microprocessors. Communication techniques for electric drives, G. S. Buja. Variable Structure Systems. Digital sliding mode torque control for induction servo drives, J. Moerschell. Vision Systems. Fast docking of a mobile robot using passive vision, A. A. Holenstein. Mobile Robot Systems. Walking robot adaptation to ground properties using fuzzy control, G. A. De Paula Caurin & S. J. Vestli. Microprocessors (Plenary Session Papers). Design and development of fuzzy controlled AC motor drive, E. Cerruto et al. Motion Control is a rapidly evolving topic, with a wide range of applications, especially in robotics. Speed and position control of a mechanical system has always been one of the main problems in automatic control, as the demand increases for advanced levels of accuracy and dynamics. The study of motion control aims to combine theoretical approaches with the realization of mechanical systems characterized by high levels of performance. The IFAC workshop focused on the evolution of: mechanical systems modelling; control strategies; intelligent instrumentation; dedicated microprocessor devices, and new fields of application. For engineers and researchers with an interest in motion control.